-The first one was Venezuela’s representative to the Interamerican Human Rights Commission German Saltron who said that it was totally false that there was overcrowding in Venezuelan jails and that the Government fed all of the prisoners. Maybe he has not seen the video I posted, or read the article about how the prisoners run the San Antonio prison in Margarita Island. And just to add to the lies and exaggeration, he claimed the Chavez Government inherited this problem, without mentioning the tripling of the number of yearly homicides since 1998 or the more than doubling of the prison population since then. In fact, homicides went down during Caldera’s Presidency, not my favorite Presidential term before Chavez, but that happens tobe a fact. -And then came Minister of Planning and Finance Jorge Giordanu who in a rare interview in El Mundo (by subscrpition only) said a few hard to swallow ones. The first one was that taking money out of the international reserves and into Fonden “made sense”, because of the very low yields around the world. Of course, he did not mention that this practice was begun in 2004, when yields had not fallen. In fact, they started going down sharply after the 2007-2008 financial crisis. Thus, this was simply looking in the rear view mirror to justify what they had done. But then, Giordani began talking about the new financial institutionality of the country and how the money from the international reserves is now “invested” for the people. 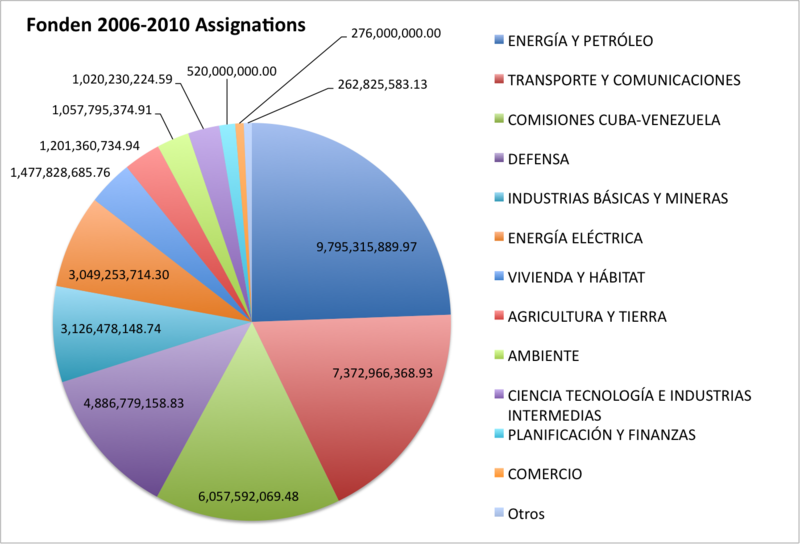 well, I don’t have the latest distribution on expenditures, but Quico did a very nice pie chart a while back (2006-201) showing that at that point the largest percentage of Fonden money went to oil and energy, followed by transportation, the Cuba-Venezuela commission and Defense in the first four places. A full 60% went to these four areas, of which only one, Transportation, can truly be considered investing for the people. For the people of Cuba maybe, but that is another matter, no? And the numbers don’t seem to have changed much since 2010, according to this article in El Universal. Oh yeah! He also said there would be no devaluation in 2013. Yeah! Sure! Such are the lying ways of the revolution.